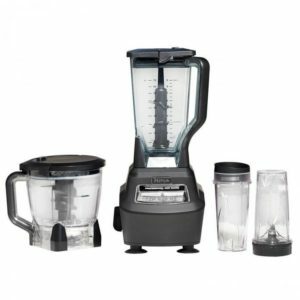 The Ninja Blender BL770 is associated with power together with a professional performance that is rarely seen in other blenders thus making it one of the best ninja blenders on the market. Coming with a design that features an XL eight-cup processor bowl, an XL 72 ounce pitcher and the Cups by Nutri Ninja, the product has all that you need as far as a blender is concerned. All these have been boosted by the presence of a powerful 2 plus Horse Power motor that is able to handle limitless tasks within just seconds thus making it that professional-quality powerhouse you need. It is a perfect machine for food processing, frozen blending as well as vitamin & nutrient extraction. This is a technology that is characterized with the delivery of exceptional power and blades that are efficiently designed to crush and pulverize through whole fruits, vegetables and ice within no time. The technology allows you to blast ice within just seconds into snow and then blend your desired ingredients into mouthwatering smoothies, sauces and dips alike. With a more than enough eight-cup capacity, the Ninja Blender BL770 is capable of handling all your dough making and chopping needs. The premium quality blades made of stainless steel will also be able to enhance an even and perfect chopping whenever you need to do some chopping. The blade has been designed and constructed with efficiency in mind, as you will be able to mix two pounds of dough effortlessly within just 30 seconds. This feature is associated with the provision of a better tasting and a more nutritious beverage preparation. With ice cubes, vegetables and whole fruits, you will be able to experience goodness from the smooth and silky cool final product of the system. You really need a drink that’s rich in vitamins as well as fiber. This system can give you just that. It has a powerful motor and crushing system that gives your tasks that fine touch that you need. It is more expensive than most of the other products in the market. However, in relativity, when compared with its performance, it is not expensive. Use the pour spout whenever you are pouring out the components from the pitcher. In case the lid has been removed, it should be noted that the blades will have to be removed before you do the pouring. This is due to the loose nature of the blades, which may make them fall out. Addition of water, juice or milk to a very thick smoothie may be essential for best results. In case your blender fails to turn on, the pitcher alignment should be checked so as to ensure that the lid has been aligned and locked. For personal smoothies together with fruit juices, dressings, sauces, salads and dips, use the Nutri Ninja cups. The product is a perfect one for home use, camping as well as in small commercial eateries. At home, within just some few minutes, you will be able to make delicious ice cream easily. Due to the fact that it is not complicated and it doesn’t involve lots of time wasting, the product can be used by almost everyone in the household. What are people talking about it? The Ninja Kitchen System, Mega (BL770) has highly been recommended to buyers by professionals and users alike. A whopping 97% of the hundreds of people who have reviewed it are certain that they would surely recommend it to those closest to them. The performance is excellent, it is durable, elegantly appealing and easy to use, clean and maintain. The Ninja Blender BL770 can comfortably be used in the processing of all those favorite foods, juicing, blending, mixing and making of smoothies. Within just seconds, your dessert dough and bread will be mixed or even juice preparation for you or the family thus considerably cutting down your cooking time. If you are out searching for the best ninja blender to buy, then this is the product for you.